Lebanese expatriate, techie, and graduate student. I am now re-reading Isaac Asimov's The Gods Themselves published in 1972. The events in the book take place in 2100 AD. A maverick scientist is warning a resistant establishment about his discovery of the dangers of Inter-Universe Electron Pumping, a new found supply of abundant free and clean energy that had revolutionized humanity. He wanted it abandoned. This is his exchange with a senator in the International Congress. "It is a mistake," [the senator] said, "to suppose that the public wants the environment protected or their lives saved and that they will be grateful to any idealist who will fight for such ends. What the public wants is their own individual comfort. We know that well enough from our experience with in the environmental crisis of the twentieth century. Once it was known that cigarettes increased the incidence of lung cancer, the obvious remedy was to stop smoking, but the desired remedy was a cigarette that did not encourage cancer. When it became clear that the internal combustion engine was polluting the atmosphere dangerously, the obvious remedy was to abandon such engines, and the desired remedy was to develop non-polluting engines." Inter-Universe Electron Pumping is not a danger to humanity as MANBEARPIG is though :). CERN Rap from Will Barras on Vimeo. 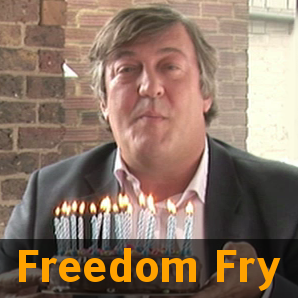 Freedom Fry — "Happy birthday to GNU"
I was introduced by my brother to Stephen Fry, an English humorist, actor, novelist and filmmaker. He presents a show on the BBC called Q.I. (Quite Interesting). Allan Davies, the "permanently installed guest", is one of the funniest comedians I've ever seen. Fry is featured in a short film that celebrates the 25th anniversary of the GNU operating system and talks about free software. Free as in "free speech", not "free beer". See link for video and more information. This picture should sum it up. I miss it already. Copyright 2007-2010 Firas Wehbe. Awesome Inc. theme. Powered by Blogger.